Holidays are tricky for me lately. As buried as I am in my edumacation, I thrive on routine because I know when I can expect to just barely pull off a project minutes before its deadline without being interrupted by disagreements over whose Mickey Mouse sticker is whose. While my über-regimented schedule lacks the spontaneity I prefer, knowing exactly when I can sit and focus free of tiny face-fives keeps me productive and sane–both highly desirable qualities in a person entrusted with the lives of multiple one-year-olds. Since I live on a planet where academic research design and Disney Sing-Along-Songs are king, I’d entirely forgotten that Easter was, in fact, this weekend, and I’m a little ashamed to confess that my gut reaction to this realization was annoyance. There goes Sunday, I thought. When the hell will I have time to be a nerdy, irritable ball of stress flipping out about seven different due dates if I have to spend the day celebrating? These were my actual thoughts. 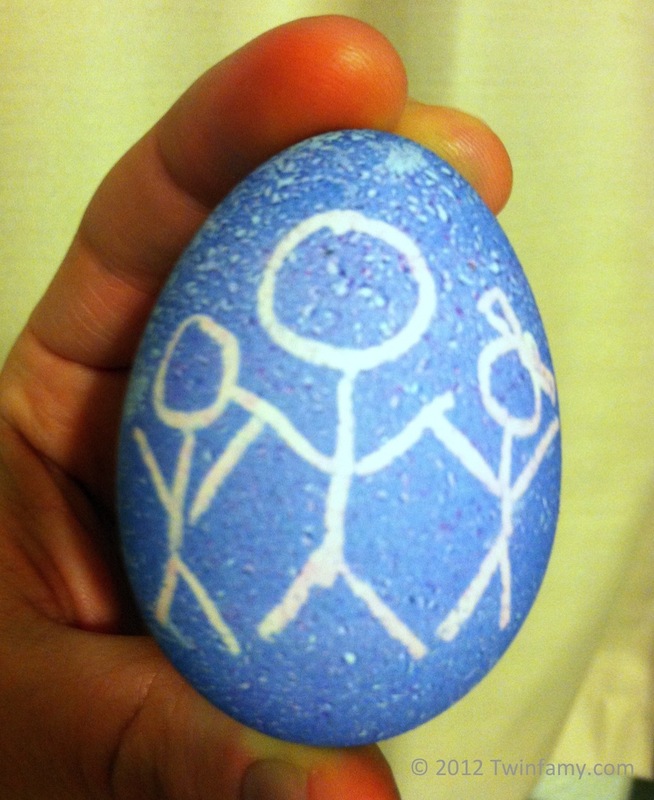 Never mind the fact that my Grandma (who I see once, maybe twice a year) is in town, or that it’s an opportunity to create memories with my wife and kids, or even the reason Easter is celebrated in the first place. No, what concerned me most was getting My Work done. It’s hard to believe it’s already the Twins’ second Easter. This time last year they could barely sit up, and now they’re running, climbing, and thwarting any baby-proofing device in their paths. So much can happen in a year, and it will pass whether you take time to enjoy it or not, which is why I do my best to soak each day in like a ShamWow, to continually devour hard drive space with photos and video of my beloved loinfruits, to remind myself to unplug from The Great Distractor–my iPhone–and tickle the Twins until they’re laughing so hard they keel over. While, if I say so myself, I do a decent job most of the time, weeks in which I’m wrestling with alien computer code, weighed down by paper submissions, and cussing out unnecessarily bureaucratic email can knock me on my heels and cause me to lose my perspective. I hate when that happens, and hate it even more to admit it. But I’m human, and so are you (sorry Skynet cyborgs–this post is over your metallic heads). So, just in case you’re harboring similar feelings about the upcoming holiday and obsessing about a to-do list that means absolutely nothing in the scheme of things, I thought I’d share my Easter Scrooge-ness with you all as a cautionary tale. And if you ignore it, tonight, you will be visited by the Bunny of Easters Past, the Bunny of Easters Present, and the Skynet Cyborg Bunny of Easters of the Apocalyptic Future. I can only pray you have carrots in the house. Happy Easter, O Loyal Reader! I truly hope it’s your Eastest one yet. If not, hasta la vista, baby. April 6, 2012 - 4:03 pm Daddy's in Charge? That is the best egg ever! Happy Easter Bro! Thanks, John! I was drawing it blindly with one of those invisible crayons, so I was pretty psyched when I pulled it out of the dye. Happy Easter you and the rest of the Willey clan! Happy Easter to you, buddy, as well as Your Director, Peanut, and Luna! Wow! I was just thinking the same thing. So much to do, and a holiday throws a wrench in all of my planning. But it makes me slow down and appreciate my friends and family for a day. Not that I only appreciate them for a day. You know what I mean. I know exactly what you mean. I fight slowing down all the time, but it’s good every once in a while–it allows me to take stock of what’s really important. Thanks buddy! All went well, and I was even able to finish everything I needed to. A nice reminder that the only thing panic accomplishes is making me a basket case. I was supposed to have this coming Sunday off work but due to a late schedule change who has to work and now Easter is nothing? That’s right this guy. I am sure that Hot Mama will feel the same way next year when she going through school and has those due dates to worry about. Sorry to hear you needed to work on Sunday. Since I’m replying to this so late (the explanation for which is in the post itself), I hope you still had a great Easter. It sounds like YOU did (http://therookiedad.com/2012/04/08/the-hunt/), but Hot Mama did NOT (http://therookiedad.com/2012/04/09/the-not-so-fabulous-easter/). Yeah, I have a feeling she’ll be in the same boat once she starts school, too. It’s a balancing act, especially with kids. But I find that even though it’s hectic, the kids are a great reminder of why you’re doing it in the first place, so it also works in your favor.